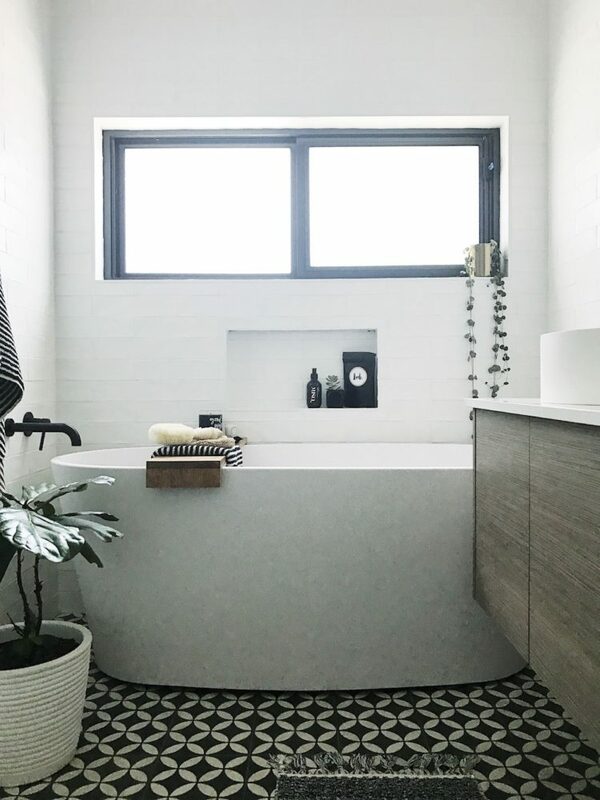 This week I restyled my bathroom and thought it would be a good time to finally share this space with you! 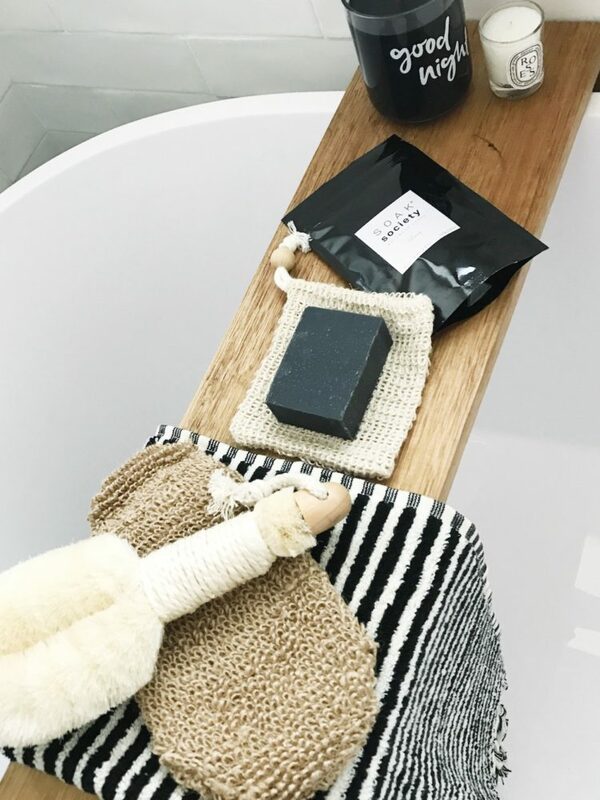 I’ve previously shared little corners of my bathroom, like when we shared our budget bathroom styling tips and our DIY bath tray, but never the full space. Today I’ll share my inspiration for the space, loads of pics and also details of all the products I used in the ‘supplier’ section so you can find them easily. 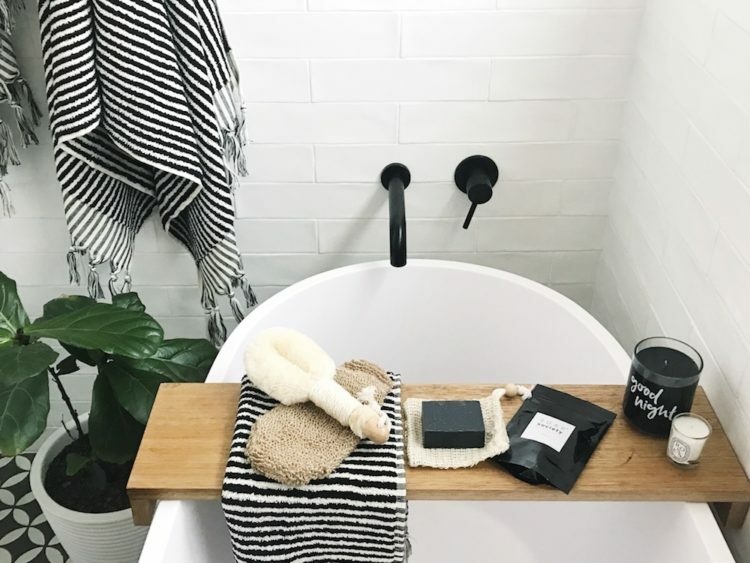 Next week I’ll share a post about the bathroom mistakes I made and how you can avoid them! 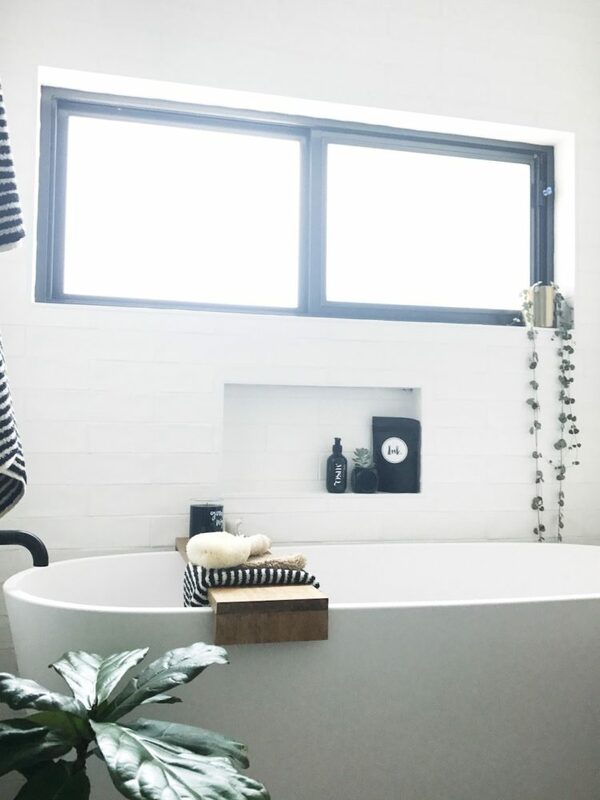 The inspiration for the bathroom started with tiles… I ummed and ahhed for a long time about what tiles to use. 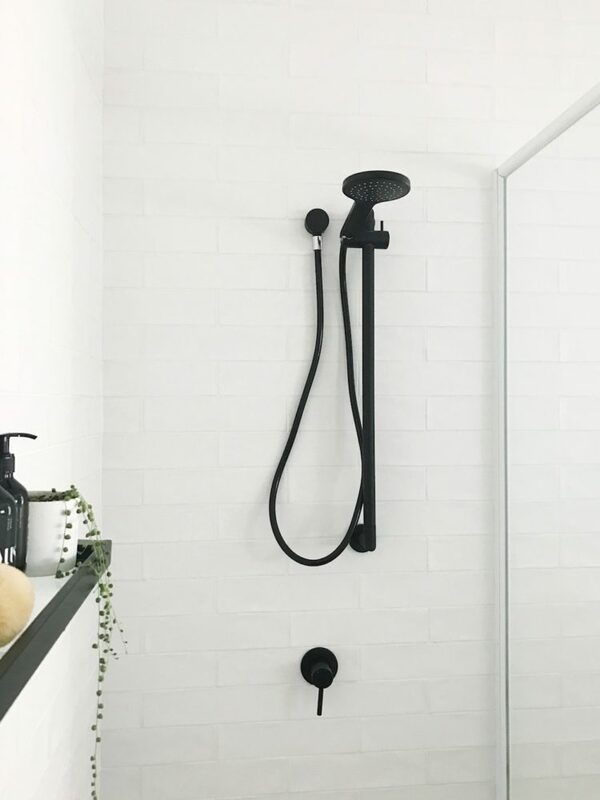 When I was initially planning the bathroom, I thought a marble tile feature wall would be beautiful but as it got closer to locking in the tile choices there was an overload of marble bathrooms on TV and social media — I began to feel like this luxe feature wouldn’t feel that special. 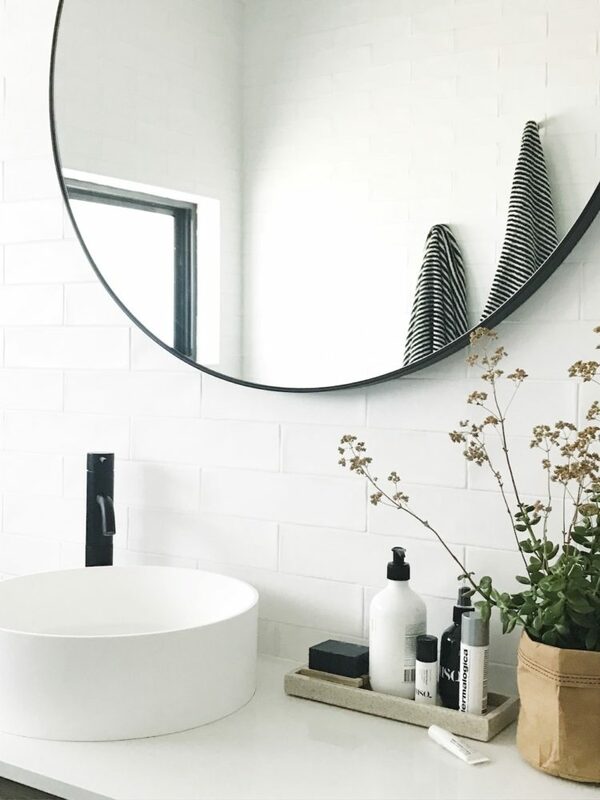 So that’s when I went back to my moodboard (aka a dining room wall I converted into an oversized inspiration board) and spotted a bathroom with black and white diamond patterned tiles. My husband said they just got a new tile in (that’s at Tile Republic) he thought I’d love and that night brought home the petal tile that I of course fell in love with right away. 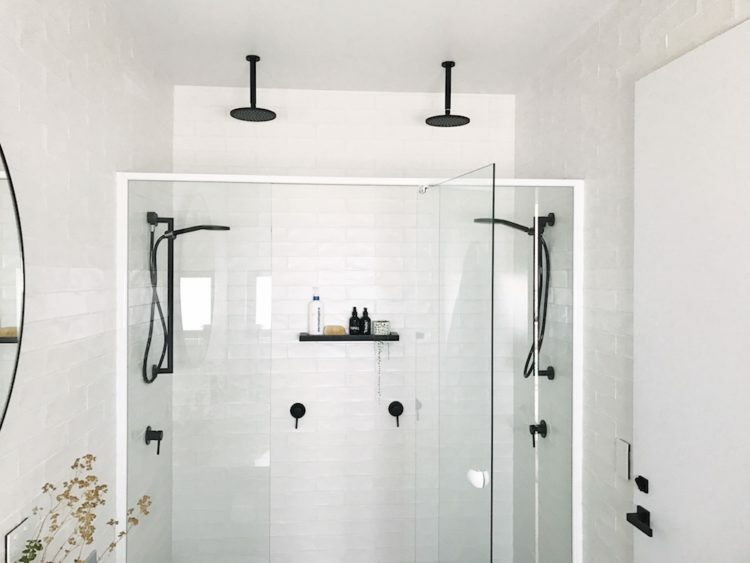 It’s a concrete (or encaustic) tile that feels much softer underfoot than porcelain or ceramic tiles. 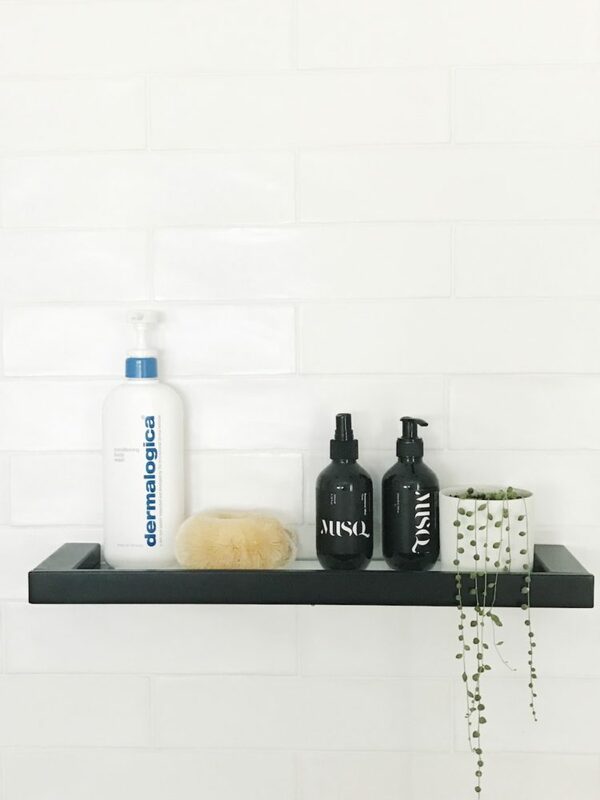 With the floor tile becoming the feature, we opted for a softer wall tile and selected a matte white handmade subway tile that has a lovely organic texture (these ones are made in Spain but there is a more affordable option available from China). 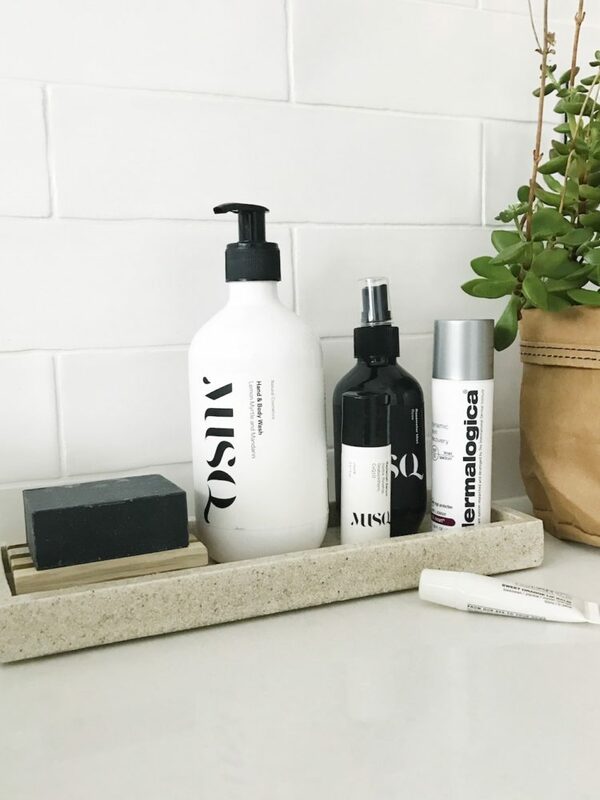 Styling-wise I wanted to play with the black and white palette but didn’t want the space to feel too contemporary or stark so I injected some natural products like the timber accents, terrazzo tray and natural brushes. 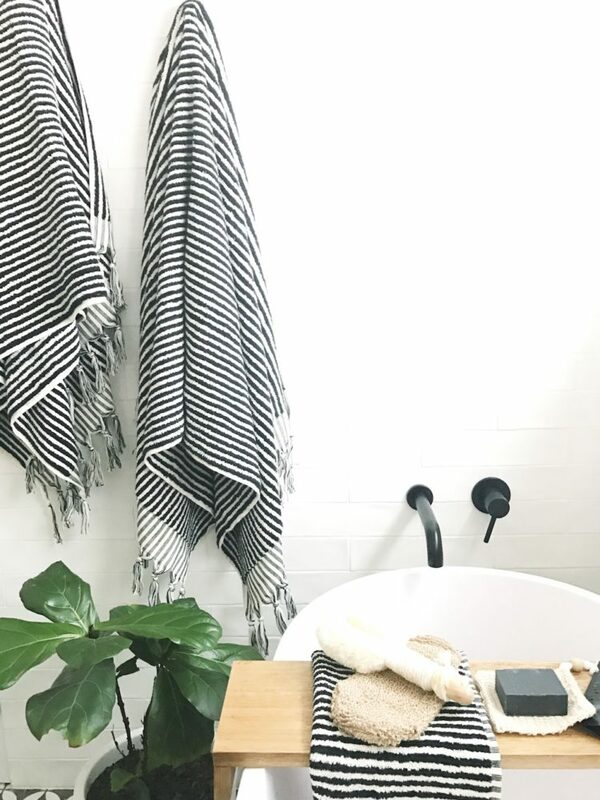 The Turkish towels also have a gorgeous texture that help to soften things. Indoor plants fill this space and I move plants about in my home quite a bit (although I know they say you shouldn’t do this as it can give them ‘shock’ and kill them). 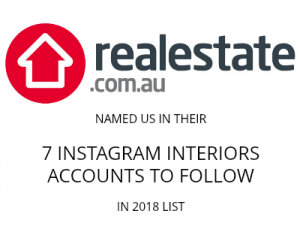 At the moment there is a chain of hearts plant on the window sill, fiddle leaf fig by the bath, jade plant on the vanity and string of pearls in the shower. The hero piece has got to be that oversized mirror that I got from Curious Grace though! It’s 1m in diametre and I love how it draws your eye as soon as you enter the bathroom. *Disclaimer: some products featured in this post were gifted. Did you centre the mirror on your basin or the vanity? We are proposing a left hand basin on a 1500cm vanity, with a long pendant to the right side or just off the side of the vanity… the mirror would likely be 80-100cm round – would you centre the mirror to the vanity or the sink? Love this! 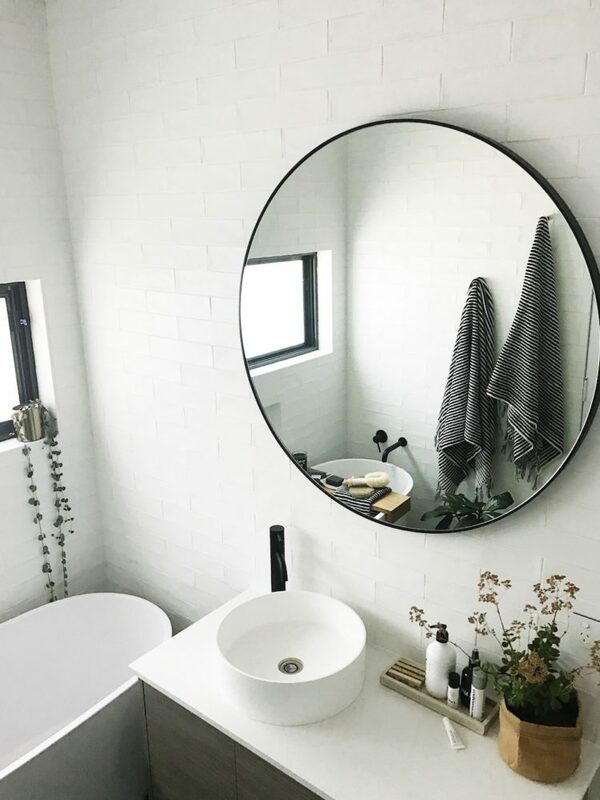 I have been looking for round mirrors with black trim, was wondering what the dimensions are for this mirror as I am not sure what size to buy, Thanks! Beautiful! I am searching for tiles just like your wall tiles. Can I ask if they are matte or sating finish? And white or off white? I would love the tile information if you are able to share. Hi Sarah, thanks for your lovely comment. The wall tiles are matte white (these ones are handmade in Spain but there’s now a cheaper Chinese copy). I’m not sure where you’re based but these are from Tile Republic in Canberra. Hope this helps! You have such a lovely bathroom. I just wanted to know the thickness of your grout line, is it 1.5 or 3mm? Gorgeous bathroom! 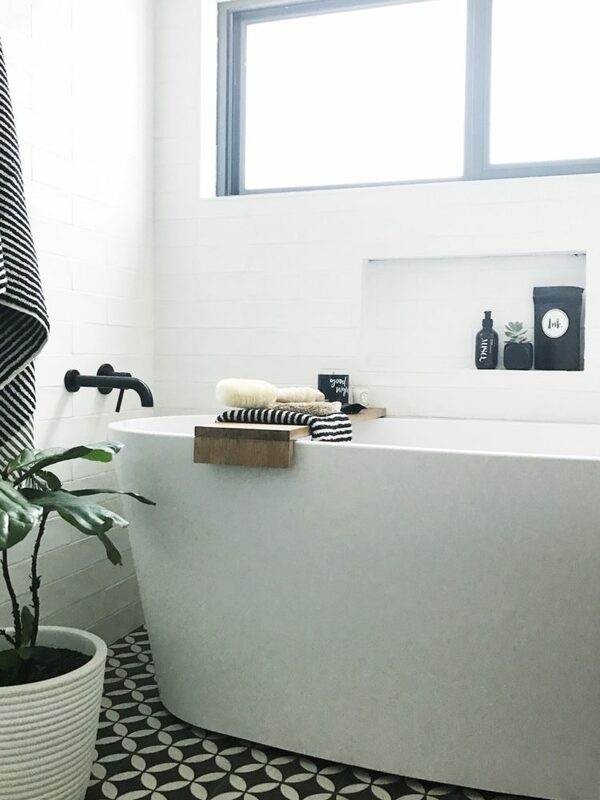 Love the black and white tiles. I have been stressing over my tile choice and concerned that the encaustic tiles are too much work. I’ve heard they need to be sealed, is this an issue or something the tiler can do? So stunning! 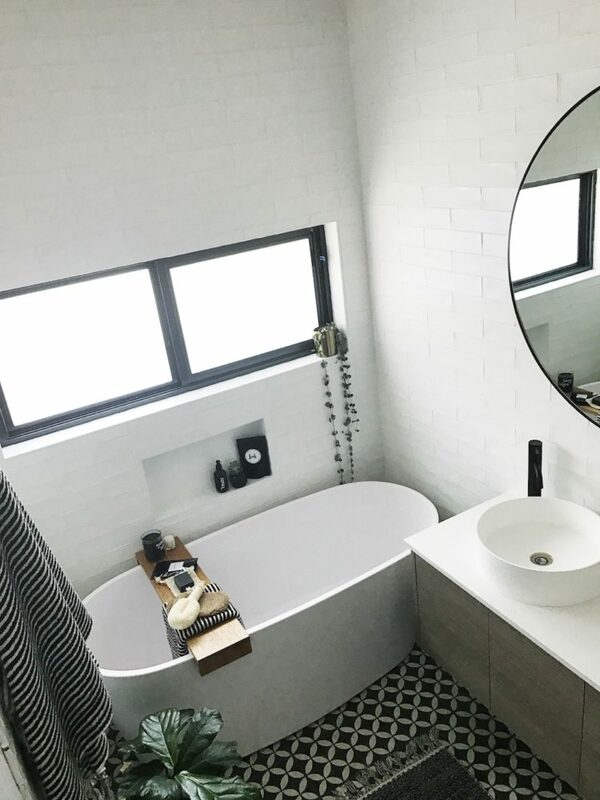 There’s major bathroom envy happening over here! Looks gorgeous Gina! Love it. I would never have guessed it was a mistake, I’ll keep my eye out for that post! The reno and landscaping are finished so now it’s just a mad dash to the finish line to get the styling done and all those little jobs that take 5 x longer than you expect hehe. We should be live one way or another by the end of this week!